What do you do when the skies are gray, and the weather isn't tempting for a flight? 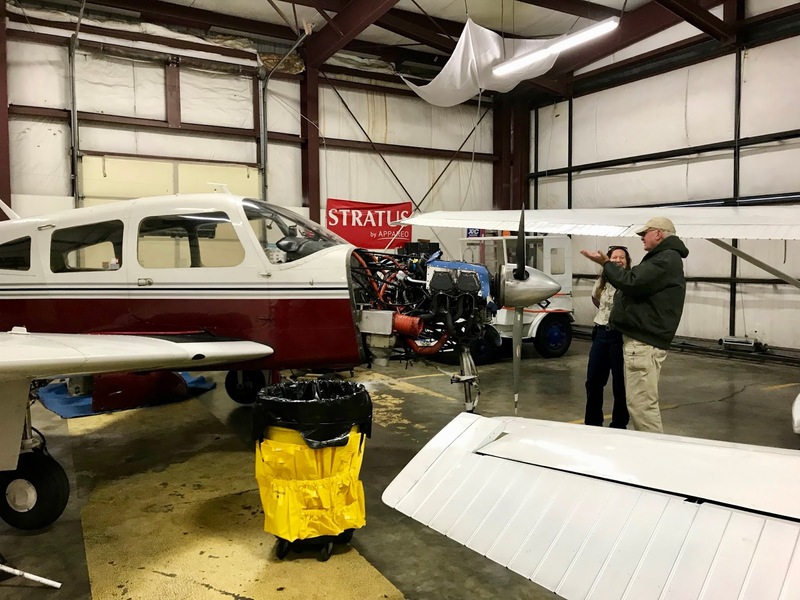 Schedule an annual inspection for your airplane. Being on a winter cycle isn't a bad thing for us here in the Pacific Northwest. Every airplane is required to have an annual inspection, and the aircraft's manufacturer has a maintenance manual that spells out what must be included. 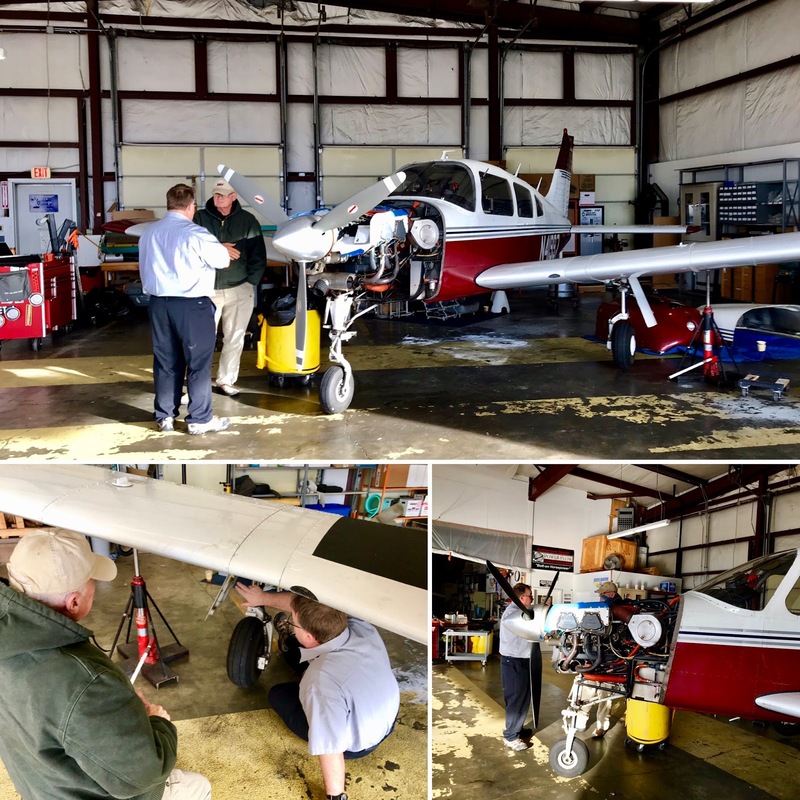 A certified aircraft mechanic and/or facility does the work. This year we took Arrow 997 to Vertex Aviation Services at nearby Skagit Regional Airport. Owner Lin Holdeman and his crew of mechanics and technicians are taking care of everything for us. Arrow 997 in the Vertex Aviation Services hangar for her annual inspection. There are two exceptions to an annual inspection. The first is for aircraft used to carry persons for hire or flight instruction. They are required to have a more frequent inspection every 100 hours of engine time. 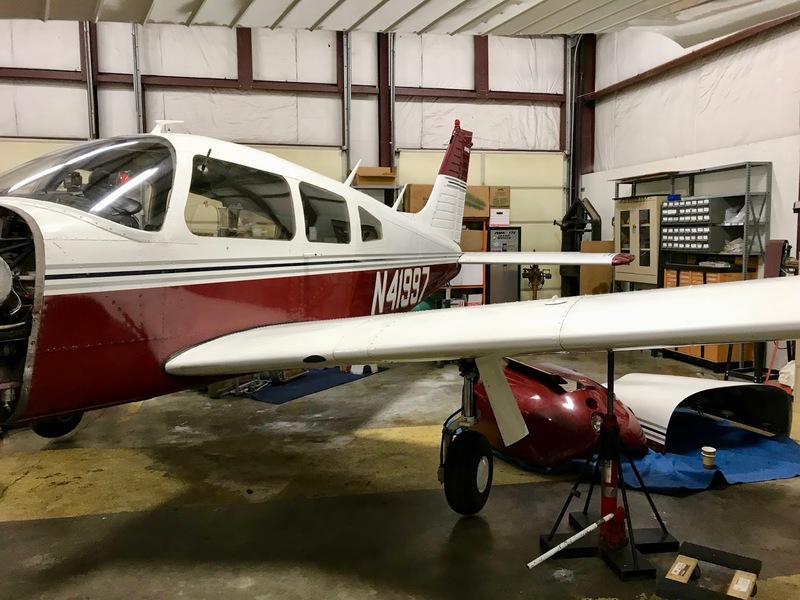 The other exception is a progressive inspection that results in a total inspection of the airplane within a calendar year. Neither of those apply to us. Wayne talks to Dorie, the Vertex aircraft mechanic working on 997. 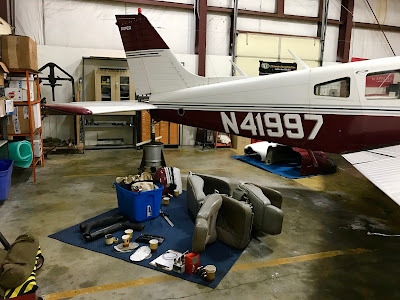 Aircraft owners can do some items in preparation for the annual inspection or assist along the way. 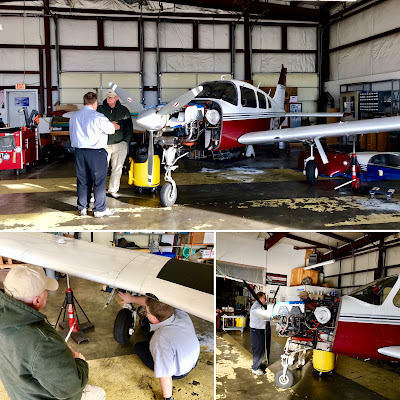 We choose to develop a "squawk list" to let the mechanics know about problems we are experiencing in addition to the airworthiness directives for inspections, parts replacement and components that have reached their end of life. Organization is a sign of a good shop. Covers and panels are removed to check components inside and out. Because this is the first annual inspection for 997 at Vertex Aviation Services, she's getting a very thorough inspection. The airplane is on jacks to test raising and lowering the landing gear. We are very pleased with the service being provided by Lin and his crew. We've asked him to book us again for next year. Vertex owner Lin give our airplane (and us) personal attention. I knew you traveled by land and sea but now I find you also take to the skies. Wishing you lots of good weather and safe flying in the New Year, Margy! Margy - I worked in the aviation industry for 15 years (human resources), with a focus on the components related to landing gear, wheels and brakes, power systems and lighting. So your post was very interesting to me, and I can certainly relate to the essential nature of these inspections from a qualified crew that you trust. Thanks for sharing this story with the Mosaic Monday community! 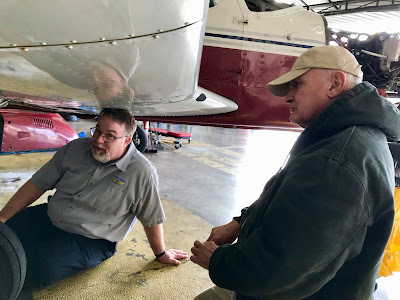 Inspections are an important part of aviation. Enjoy flying - the coast must look beautiful and wild from the air. Now that is very interesting. You guys have so much to take care of. Flying sounds like lots of fun. Wishing you a great year of flying adventures.